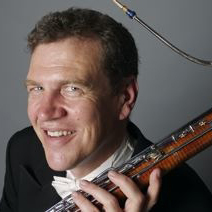 Bassoonist Jeff Robinson recently relocated to Manhattan from Houston, TX, where he has been a member of the Houston Symphony since 1992. Hired during the tenure of Christoph Eschenbach to play bassoon and contrabassoon, he acted as Associate Principal Bassoon from 2003 to 2007. 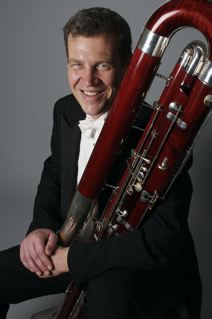 He also serves as Principal Bassoon in the Chautauqua Symphony Orchestra (2004-present). In 2004, on behalf of Robinson and his colleague Cynthia Meyers, the Houston Symphony commissioned Damian Montano’s Concerto for Piccolo and Contrabassoon, which was enthusiastically received. During the summer, Robinson teaches and performs at the Texas Music Festival and plays Principal Bassoon with the Chautauqua Symphony Orchestra where he teaches and coaches for the college program. He has performed with the National Symphony, the Santa Fe Opera, the Grand Tetons Festival Orchestra, and Ars Lyrica Houston. He has also been a soloist with the Houston Symphony, the Chautauqua Symphony Orchestra, and the New Mexico Symphony Orchestra. A native of Palo Alto, CA, Robinson attended the Eastman School of Music, studying with K. David Van Hoesen. While continuing to perform with the Houston Symphony, Robinson works from New York as a solo, chamber, and orchestral musician, and teaches private lessons and master classes throughout the U.S. Please click on the selections to hear brief examples of live performances.